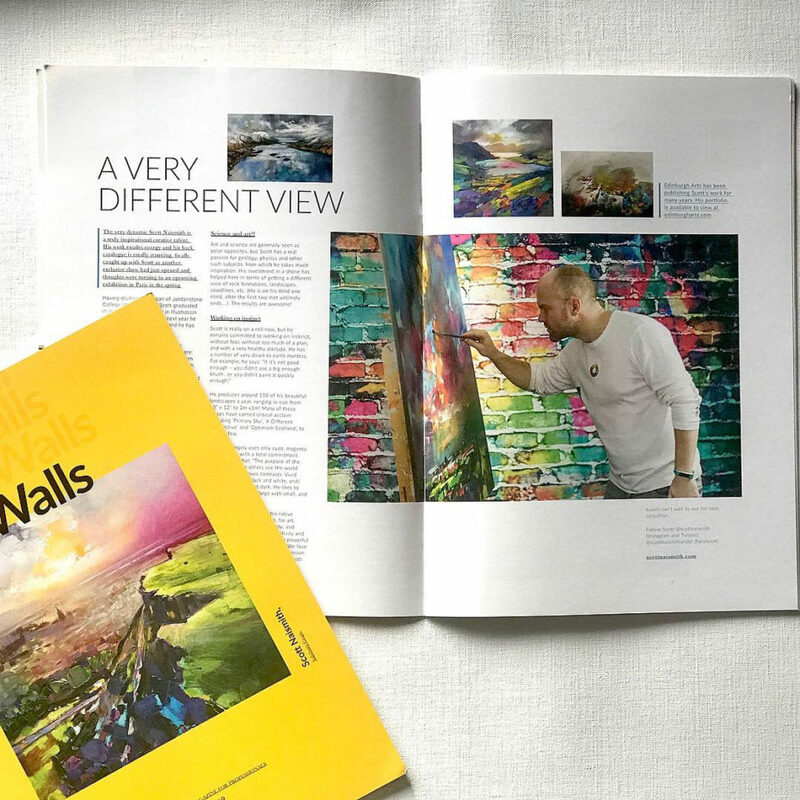 Four Walls, the art and framing magazine for professionals, interviewed me for their new year 2019 edition and it was great to be featured on their brand new look front cover. You can read the article in full below. 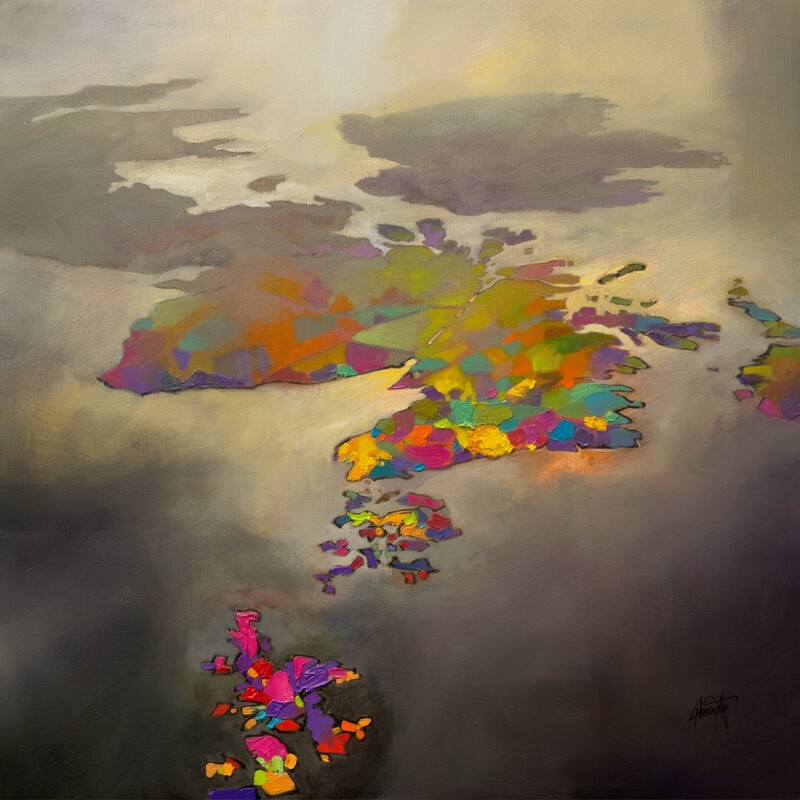 The very dynamic Scott Naismith is a truly inspirational creative talent. His work exudes energy and his back catalogue is totally stunning. 4walls caught up with Scott as another exclusive show had just opened and thoughts were turning to an upcoming exhibition in Paris in the spring. Having studied at Duncan of Jordanstone College of Art, Dundee, Scott graduated in June 2000 with a BDes in Illustration and Printmaking. The very next year he got his first solo exhibition and he has not stopped since! His inspiration comes from three main sources: Turner for atmosphere; Matisse and his principles of freedom of colour; and Abstract Expressionism – specifically freedom of expression. Matisse said: “I don’t paint things. I paint the difference between things.” Scott has totally bought into this sentiment. While undoubtedly a fantastic talent, Scott’s profile has also been escalated by an early adoption of all things digital. His work has enjoyed huge online success for over 10 years now and he has posted all sorts of content on YouTube which has resulted in the build-up of over 28,000 subscribers. Despite not having time to produce new videos at the moment, Scott is still getting 1,000 hits a day from people looking at his work, views of the world and tutorials. His posts on ‘the truth about colour’ are especially popular. Scott is a big fan of all social media and even had shares in Facebook! Although it is Instagram that he loves best from a visual point of view, like many artists. Unsurprisingly, Scott is attracting a lot of interest from traditional media and other influencers too. He featured in an Australian TV programme called ‘Colour in your life’ which can be found on YouTube too and is well worth a watch. Art and science are generally seen as polar opposites, but Scott has a real passion for geology, physics and other such subjects, from which he takes much inspiration. His investment in a drone has helped here in terms of getting a different view of rock formations, landscapes, coastlines, etc. (He is on his third one mind, after the first two met untimely ends….). The results are awesome! He produces around 150 of his beautiful landscapes a year, ranging in size from 12” x 12” to 2m x1m! Many of these pieces have earned critical acclaim including ‘Primary Sky’, ‘A Different Perspective’ and ‘Optimism Scotland’, to name a few. His work largely uses only cyan, magenta and yellow - with a total commitment to the belief that: “The purpose of the artist is to make others see the world differently.” He loves contrasts. Vivid colour alongside black and white, and/or grey. Light against dark. He likes to mix acrylics with oil, large with small, and texture with flat. The passion Scott has for his native Scottish countryside, for life, for art, shines through so very strongly; and combined with his energy, positivity and creativity he produces incredibly powerful and emotive artwork. We love it. We love his talent, but we also the optimism that is exudes. And we could all do with more of that! 4walls can’t wait to see his next collection. Pictured: A Different Perspective by Scott Naismith, published by Edinburgh Arts. Edinburgh Arts has been publishing Scott’s work for many years. View all limited edition paper prints HERE.